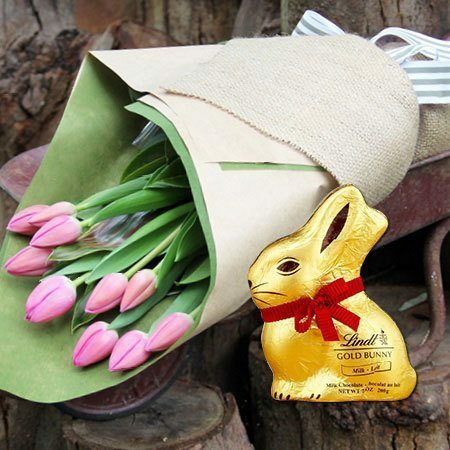 One of our most popular bouquets at Easter, these beautifully gift wrapped pink tulips are arranged with fresh foliage and come with a deliciously delightful Lindt chocolate Easter bunny (100g). To send flowers online for Easter, simply click `buy now` and let our florist team take care of the rest. Alternatively, place your order via our floral consultants toll free on 1800 66 66 46. *Please note: The pictured bouquet and bunny offer is specific to Sydney and Melbourne metro region only deliveries for Easter.